Copper is often thought of as an industrial material. But with its eye-catching, shiny surface, copper works well in both modern and more traditional kitchen spaces. It comes in a number of finishes, making it a design-flexible material perfect for use in styles ranging from mid-century modern to farmhouse, traditional and even rustic. Copper pieces with a patina are more toned down and make the piece feel a bit more aged. This finish style works wonderfully in rustic and more traditional spaces because it isn’t as bright. 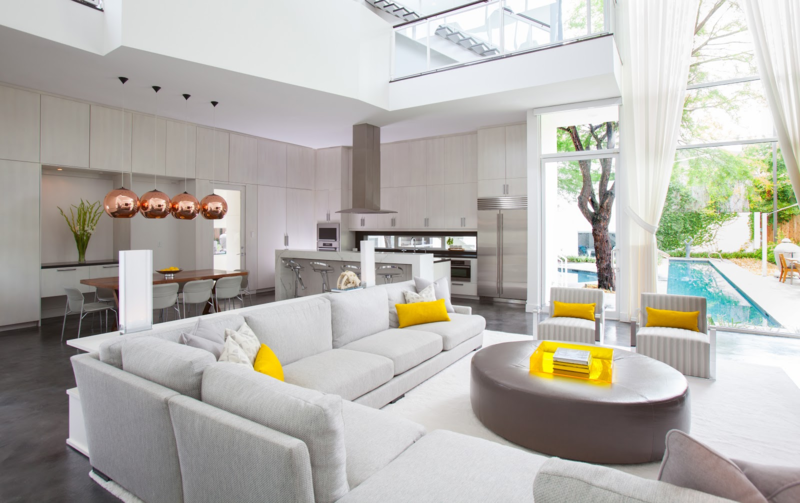 A shinier finish tends to work best in more streamlined and modern interiors. The brighter finish gives it a sleek and very polished feel. Kitchens and bathrooms are the most common places we see copper being used because of its beauty and functionality. Copper is naturally anti-microbial, making it the perfect option for kitchen sinks and vent hoods that often need frequent cleaning. This property eliminates the need for harsh chemicals, which allows the copper to retain its wonderful design features for years to come. Lighting is another way to incorporate copper into your kitchen design. Copper’s reflective qualities will illuminate the room, adding depth and dimension. These copper pendant lights complement the modern design aesthetic and definitely make a statement in this open kitchen/living room space. 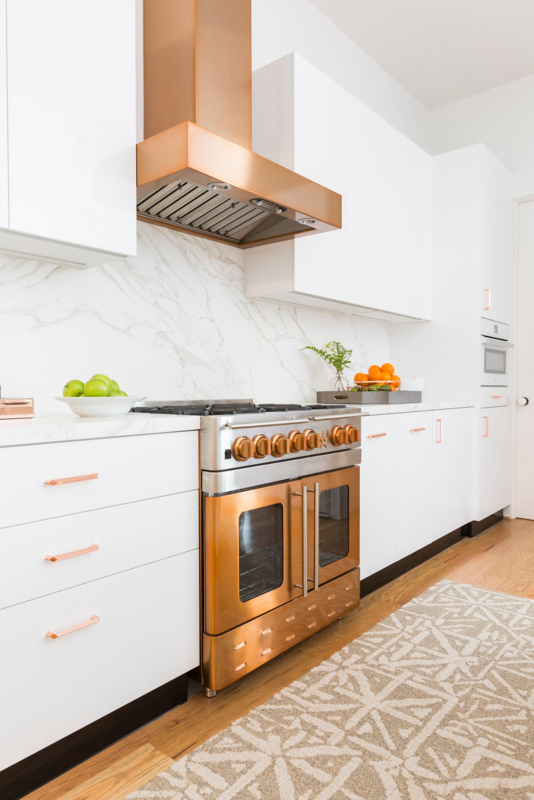 If you’re not ready to make the commitment to using copper appliances or lighting fixtures, add subtle touches of copper by switching out knobs and pulls on cabinetry and doors. It’s an easy way to introduce copper into a kitchen without it becoming the focus of the room. Don’t be afraid to mix your metals either! The warm undertones of copper play well with the cooler tones of stainless steel and the classic shine of gold. For a more powerful impact, I love going bold with a copper vent hood and range. The vibrant and unexpected color definitely break the mold from traditional stainless steel and make a huge statement. It gives the space a more rustic, antique feel. 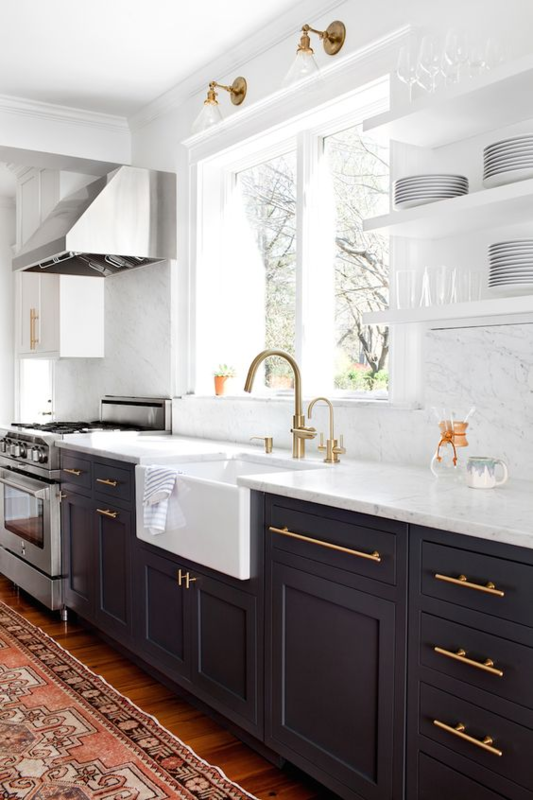 No matter what finish you choose or whether you decide to use copper appliances or accents, it’s a great way to add warmth and elegance to your kitchen without sacrificing style. And copper gets better with age, so the pieces you choose to use will continue to stand out in your kitchen for years to come! To get more design ideas and inspiration on ways to incorporate copper into your kitchen design, check out our . I’d certainly always traditionally associated copper with stark, industrial looks, so really refreshing to see it in a softer context. In these examples it’s been blended so well with both decor and furniture pieces as well. Thanks for sharing these.